fair food | Winners Drink Milk! State Fair Food…Yes, It IS possible to eat healthy. That State Fair is just around the corner and it is filled with seventeen days of food and fun. So let’s talk about the food, which is one of the main reasons people attend the State Fair. Some people have their favorite stops and some people like to go for the most exotic, obscure food they can find. Sure, the State Fair is known for its greasy, fatty, and fried food but I think you can ALWAYS find a lighter side to anything. Enjoy at least one indulgence. Part of the allure of a fair is the specialty foods, so don’t deprive yourself. Don’t arrive starving. You might think you are ‘saving’ calories by not eating all day so you can splurge at the fair. But you will end up eating more than if you would have eaten a small snack beforehand. Keep things small by sharing with your friends. An easy way to try out fun carnival food without going overboard is to split dishes with your friends. There ARE healhy options at the fair. Choose healthy when you can. Not all fair food is bad, but some is definitely better than others. Look for grilled items instead. 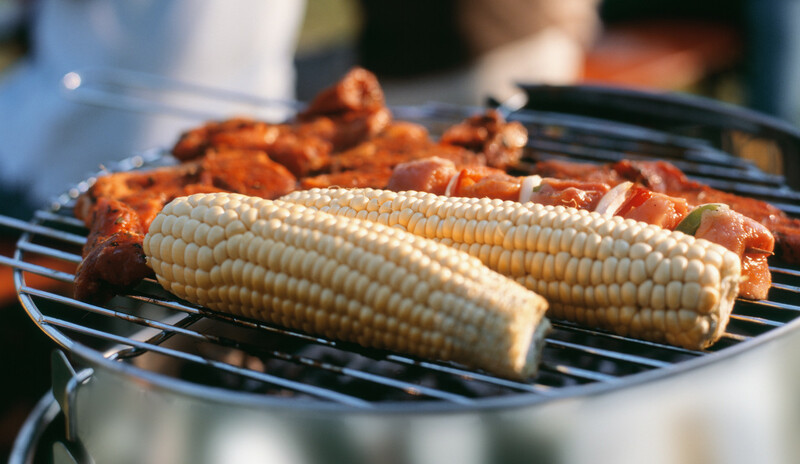 Grilled corn on the cob, meat kabobs, and barbecue turkey legs are available at most fairs. I know at the Dairy Bar they are serving cottage cheese and milk which is low fat and packed with nutrition. The fair is and always will be about food, but you can also focus on creating special memories with your family.